Bee colonies across the world are disappearing—a phenomenon dubbed colony collapse disorder (CCD). Most fruits and vegetables are dependent on the pollinating services of bees. Apple orchards require one colony of bees per acre in order to be adequately pollinated. At least one-third of the American food supply depends on bees pollinating crops. A consensus among beekeepers is that the bee die-offs are definitely related to toxic chemicals. Increasingly, a systemic type of pesticide called neonicotinoids is being blamed for bee die-off. Neonicotinoids are now used on most of American crops, especially corn. This newer class of chemicals is applied to seeds before planting, allowing the pesticide to be taken up through the plant’s vascular system as it grows. As a result, the chemical is expressed in the pollen and nectar of the plant. These insecticides are highly toxic to bees because they are systemic, water-soluble, and pervasive. They get into the soil and groundwater where they can accumulate and remain for many years and present long-term toxicity to the hive. Neonicotinoids affect insects' central nervous systems in ways that are cumulative and irreversible. Even minute amounts can have profound effects over time. One of the observed effects of these insecticides is weakening of the bee's immune system. Forager bees bring pesticide-laden pollen back to the hive, where it's consumed by all of the bees. Later their immune systems fail, and they fall prey to secondary, seemingly "natural" bee infections, such as parasites, mites, viruses, fungi and bacteria. The disappearance of bee colonies began accelerating in the United States shortly after the Environmental Protection Agency (EPA) allowed these new insecticides on the market in the mid-2000's. France has banned Imidacloprid for use on corn and sunflowers after reporting large losses of bees after exposure to it. They also rejected Bayer´s application for Clothianidin, and other countries, such as Italy, have banned certain neonicotinoids as well. The EPA acknowledges that “pesticide poisoning” may be one factor leading to colony collapse disorder, yet they have been slow to act to protect bees from this threat. Another theory of colony collapse disorder (CCD) is that it's being caused by genetically engineered crops (GMO’s) - either as a result of the crops themselves or the pesticides and herbicides applied on them, such as Roundup. In one German study, when bees were released in a genetically engineered rapeseed crop, then fed the pollen to younger bees, scientists discovered the bacteria in the guts of the young ones mirrored the same genetic traits as ones found in the GE crop, indicating that horizontal gene transfer had occurred. Chemical companies like Monsanto are clearly seeking to take as much control of the food supply as possible by controlling virtually every aspect of crop production. Monsanto has received increasing amounts of bad publicity over their potential role in the devastating demise of bees. Reduce your lawn area and plant a garden or other natural habitat. 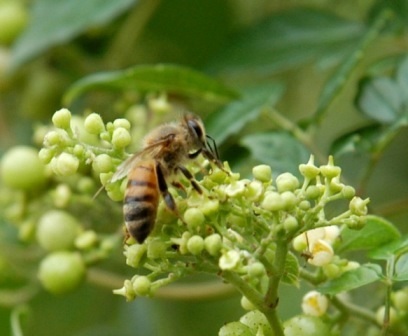 Both flower and vegetable gardens provide excellent natural honeybee habitats. Support the Texas Organic Research Center. TORC's goal is to improve health and thus quality of life by making natural organic management programs the new mainstream. TORC develops programs that support bees. If you are interested in more information about bee preservation, the following organizations are a good place to start: American Beekeeping Federation and Texas Honeybee Guild. If you have any questions on this newsletter or any other topic, tune in Sunday 8 am -11 am (CST) to the Dirt Doctor Radio Show. Listen on the internet or find a station in your area. The phone number for the show is. Please share this newsletter with everyone in your address book and all of your friends on Facebook and Twitter to help me spread the word on organics.